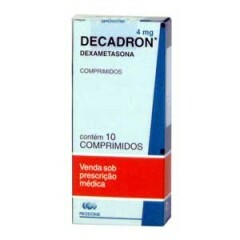 Approximately 30% of patients taking Decadron (Dexamethasone) may experience one or more combination of side effects. Commonly experienced Decadron side effects include stomach upset, heartburn, transient elevated blood glucose levels and headaches, although many other adverse effects are often encountered. These side effects are due to the suppressive nature of Decadron on the immune system, and associated histamine inhibition. Side effects such as thinning and fragile skin, urticaria, dermatitis, inhibition of wound healing, alopecia androgenetica and unexplained rashes are all common happenings. Hepatic side effects are frequently experienced following oral administration of Decadron, as injectable preparations bypass hepatic circulation and are not subject to regulation by the liver. There have been reports of Hepatomegaly (enlarged liver), and rarely hepatitis of the liver. Renal adverse effects are experienced because of the ability of Decadron to cause fluid retention. Also common is sodium retention, and sometimes deadly potassium depletion.